This is a delicious Asian style appetizer. Cut the chicken filet into strips and season them with salt and pepper. Cut the spring onions into centimeter cuts. Heat the sesame oil in a frying pan or wok and stir fry the chicken for 2 minutes on high heat. Then add the sugar-snaps and stir fry for another 3 minutes. Lastly throw in the spring onions and the chopped up vegetable broth tablet. 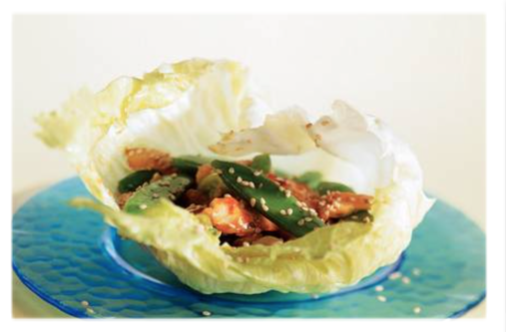 Put the lettuce leaves on a plate or in a glass, to give the leaves shape, and fill with the chicken mixture. Lastly sprinkle with sesame seeds. Done!